Shamus was whelped a week after the 911 attacks, and was named to reflect the patriotism in America. Sean was 6yrs. and needed a companion, so we started to look for a suitable addition to add to the family. Seamus, is an older half brother to Reagan, same mother, different father………and they were completely different in temperament, personality and size. Shamus was a big boned boy and tall and outstanding head, and a beautiful straight dark coat. His pedigree was American on both sides. 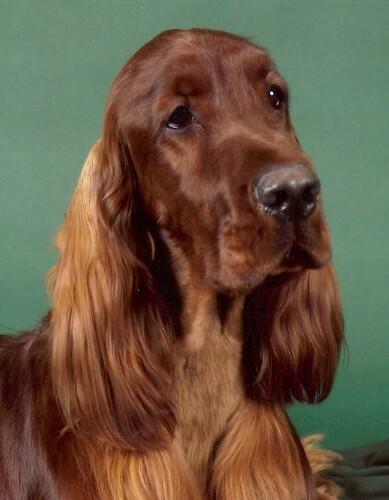 He was the dog that got us to go back to the show ring to compete, and eventually into breeding our own Irish Setters. 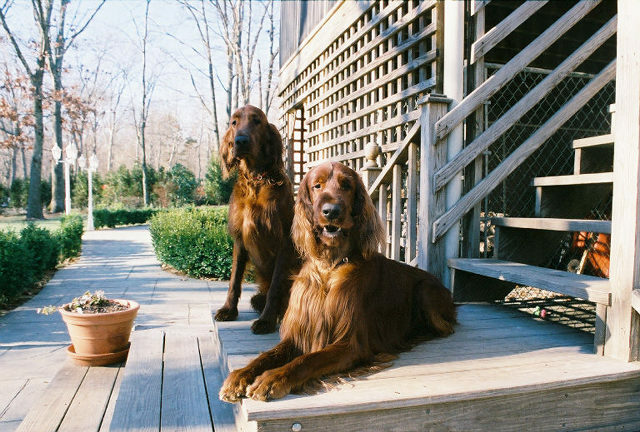 Shamus came to Erinshire Irish Setters as a pet, but as you can see from his photo, he was perfection! 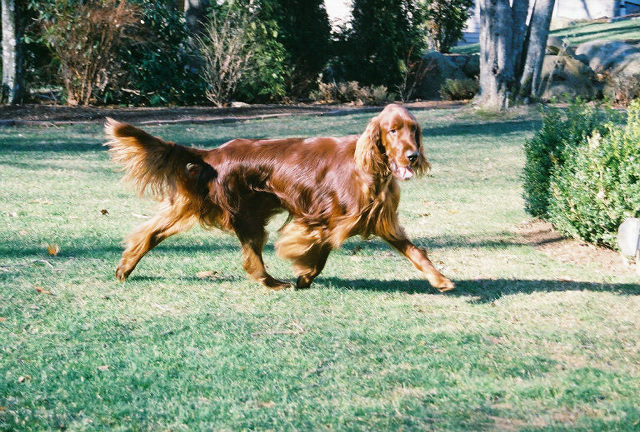 He was shown by his breeders through 2004-05 winning the Irish Setter Club of New England summer Specialty in both years for majors. 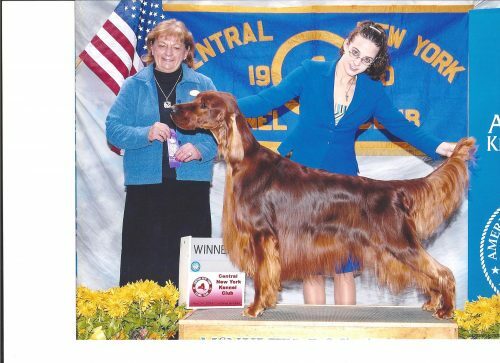 He finished his Championship in November 2007, needing a single point, Brenda showed him and completed his AKC Championship. Shamus, as beautiful and stunning as he was in the show ring, he just did not have the desire to be a show dog, he did not have the type of personality that is required to be on the show circuit weekend after weekend, he was just happy to stay home with Lee and keep him company. Once he finished his AKC title, he was never shown again. If a dog does not want to be a show dog, they pursue other titles in Agility or Obedience or Therapy Dog …….We don’t believe that every dog has to be a show dog, to be happy. Below are some great photos of Shamus and his pedigree. 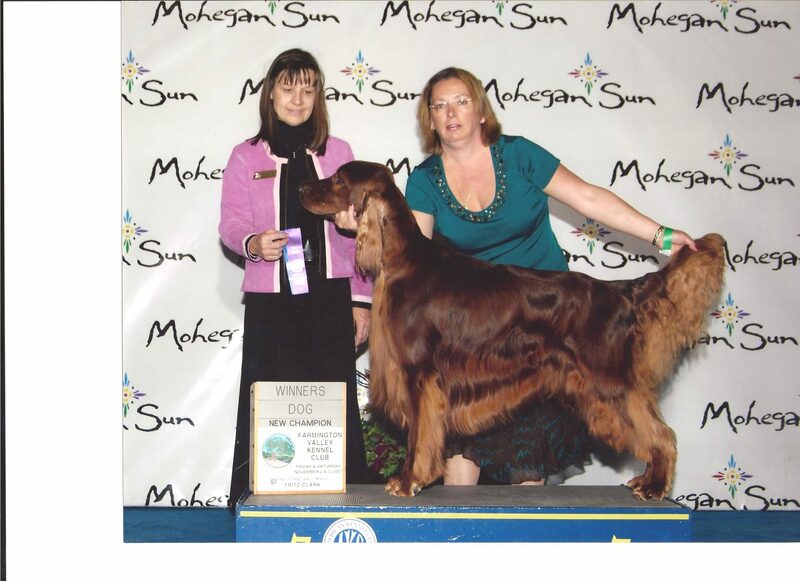 Samus with Brenda at his last dog show …..finished AKC Championship Shamus at 4yrs.